Thank you for sharing a few moments of your time to view my Patreon page. I'm a storyteller with a lot of fun new comic stories that I would love to tell and I'm asking you to be a part of it. Me... I can't help it, this is just something I've "gotta do" before I burst. With all the new methods of digital self-publishing available, it has become easier than ever for a creator to share their work. And that is my goal here; to have fun, create new and interesting new stories and share them with you online and totally FREE to read. No strings attached. Simply visit my website www.sidekick-d.com and get start reading! 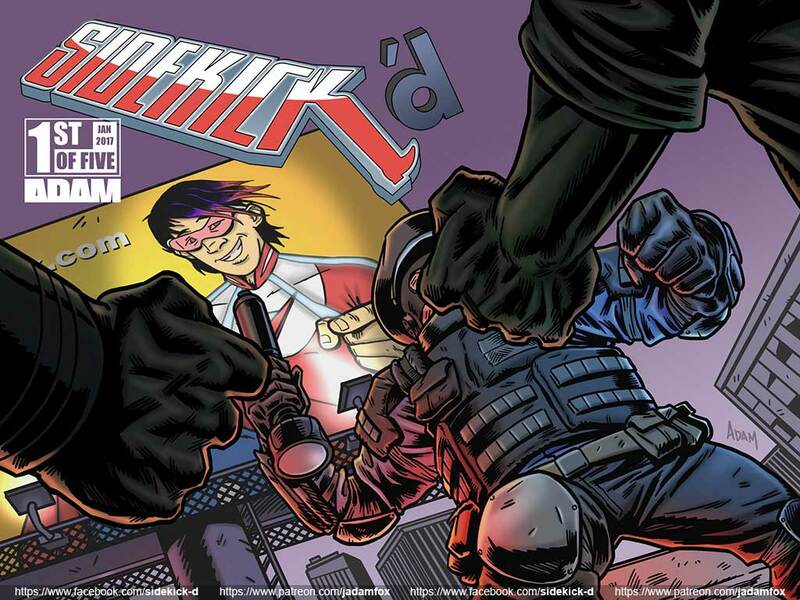 Visit the Sidekick-d Facebook page for an eight page preview of the first issue! I'm traditionally trained as a sequential artist and animator and I've become inspired by new digital media to break the wall of traditional static comics and try my hand at "motion" comics. These are comics that change frame-by-frame and reveal new panels, movements, and balloons as you progress through the story. I am working completely digitally. This means, I need computer equipment, drawing tablets, and time... lots of time. This is where you come in. If you have the means and wish to contribute to the project, your dollars will be highly appreciated as I work on the current, and future, motion comic stories. A Hardy "thank you" to all current, and future, supporters. You are a valued member of my team; helping make my dream of creating motion comics a reality. The "Night Watchman" was Grimes Central's first vigilante hero twenty five years ago. He became a beloved icon of justice and inspired other heroes. But, after he lost his sidekick under mysterious ciurcumstances, he disappeared from the lime-light and is thought to be dead. In truth, he simply stepped out of the spotlight and took a job as "a" night watchman at a local library. But, when the place is locked up for the night, and he is all alone, he secretly steps out as "the" Night Watchman to fight crime and clean up his city. But, now in his fifties, fighting crime alone isn't as easy anymore and The Night Watchman decides it is time to, once again, take on a sidekick. But, he gets quite a bit MORE than he was asking for with his overzealous new partner. Especially once The Night Watchman learns that HE may have just been sidekick'd! Copyright © 2016 Adam Fox. All rights reserved. 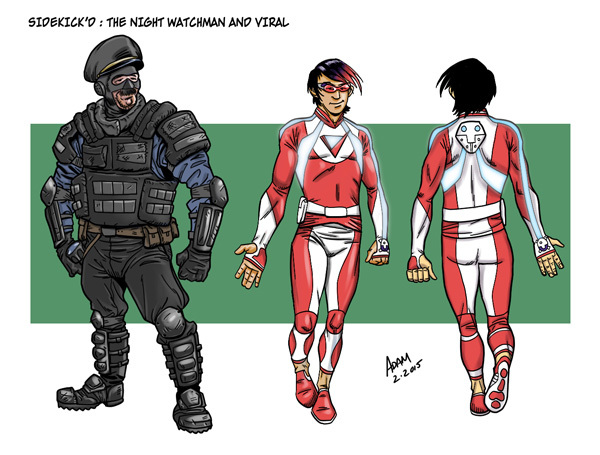 SIDEKICK'd (Including all prominent characters featured herein), its logo and all character likenesses are copyrights of Adam Fox. Access to the Patreon-only feed and my thanks! Your name listed on the "Thank You" page(s) in the final issue of the series! Your name listed in the separate "Superheroes Thank You" page(s) in the final issue of the series! You've given me a general warm feeling of being mildly appreciated! You are also helping me afford the web hosting costs to distribute the project FREE-TO-READ online!